If you ar flexible enough and want to visit Cuba at the end of classic main tourist season you may consider this attractive deal with Condor. Based on their service you may now book cheap return flights from Germany to Cuba. 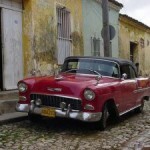 Air tickets from Frankfurt to Havana are available from just €190! Checked luggage up to 20kgs is included in this fare. Althought changing a lot recently Cuba is still one of the places on Earth which still has its unique charm that you will be not able to experience anywhere else..
As mentioned this offer is based on Eurowings. In this case 23kg checked in luggage is included in base fare. To book the cheapest fare to Cuba available please look for travel dates in May 2019. Thanks to Cologne is connected by many low-cost carriers from with many of the cities in Europe this could be also solution not just for citizens in Germany willing to visit Cuba, jewel of the Carribean sea..To book some affordable hotel you may compare your hotel rooms at booking servers such as Hotels.com, Hotelopia or Booking.com. If you are looking for some cheap connection flight to Germany from your home city we recommend to use service of Skyscanner. This tool gives you quickly an idea which low-cost carrier offers the best solution. Booking sample of cheap return flights from Germany to Cuba for €190. In this case you would be departing from Munich to Frankfurt on 13h of May. Your return flight from Caribbean to Europe would take place on 25th of May 2019.